Inpatient falls and fall-related injuries continue to be the largest category of reported incidents in the acute care setting. Falls occur in many settings: In one week, Med League got four calls about falls: a young brain injured woman who fell off a treadmill at home while under the care of an aide, an elderly woman who fell getting off an examining table in a doctor’s office, a woman who fell in the hospital just before the nurse reached her side, and a man who fell walking out an adult day care setting. The first three cases resulted in lawsuits. The last one has not been filed yet. About 1,800 fatal falls occur among residents of US nursing homes each year. 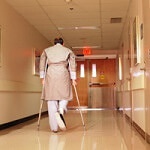 About 10-20 percent of nursing home falls cause serious injuries. Two to six percent cause fractures. Many patients need to spend at least a year recovering in a long term care facility. Some never return to their homes. In addition to fractures, elderly people suffer soft issue injuries, head trauma, and lacerations. The 1% of elderly people who fall and sustain a hip fracture have a 20-30% mortality rate within a year of the fracture. One quarter to three quarters of people who lived in the community do not recover their prefracture level of function in ambulation or activities of living. A fall can be life-altering for this group. Fear of falling can lead to reduced mobility, deconditioning, dependency, social isolation, and diminished quality of life. A fall can result in a major disruption to an older person’s life- injury, hospitalization, and rehabilitation. Falls have many liability issues. Some center around what should have been done to prevent the fall. Hot issues include use of side rails, frequency of monitoring to prevent a fall, responsiveness to the patient’s requests for help, and unsafe equipment such as wheelchairs. A delay in treatment can close a window of opportunity to change the outcome- such as in head injury or spinal cord injury that results from a fall. The healthcare providers did not collect the appropriate data needed to assess the patient’s condition. The person who fell was not thoroughly assessed and an injury was missed. The appropriate data was collected but the healthcare provider did not have the knowledge to critically analyze the data to find its meaning. The signs of a fracture were overlooked. The data was collected and analyzed, but the appropriate healthcare provider failed to respond to another person’s concerns. The nurse could not get the attention of the physician or the nurse’s concerns were dismissed. The concerns of the bedside clinician were heard, but the provider did not or could not make timely decisions about what to do about the changes in the patient’s condition. Possessions- phones, water, glasses, call lights and bedpans within reach.